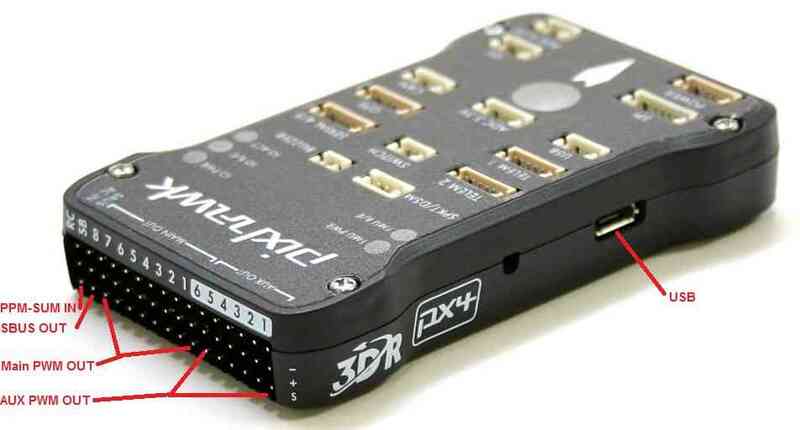 The Pixhawk 1 was originally manufactured and sold by 3DR. A slightly improved but fully compatible variant can now be obtained from mRo: mRo Pixhawk 2.4.6 Essential Kit! Serial 1 (Telem 1) and Serial 2 (Telem 2) Pins: 6 = GND, 5 = RTS, 4 = CTS, 3 = RX, 2 = TX, 1 = 5V. The system’s serial console runs on the port labeled SERIAL4/5. The pinout is standard serial pinout, to connect to a standard FTDI cable (3.3V, but it’s 5V tolerant). The Spektrum/DSM port is for connecting Spektrum DSM-2/DSMX receiver modules. 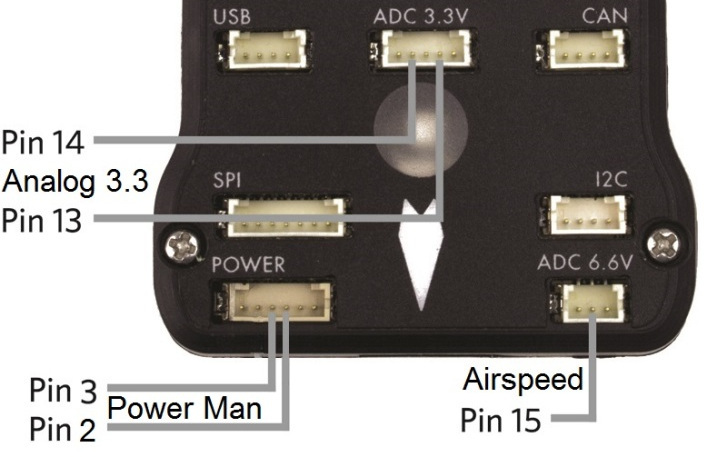 This section lists the analog pins available on the Pixhawk. These are virtual pins, defined in the firmware. Virtual Pin 13 and ADC 3.3V connector Pin 4: This takes a max of 3.3V. May be used for sonar or other analog sensors. Virtual Pin 14 and ADC 3.3V connector Pin 2: This takes a max of 3.3V. May be used for second sonar or other analog sensor. Virtual Pin 15 and ADC 6.6V connector Pin 2: analog airspeed sensor port. This has 2:1 scaling builtin, so can take up to 6.6v analog inputs. Usually used for analog airspeed, but may be used for analog sonar or other analog sensors. Virtual Pin 102: Servo power rail voltage. This is an internal measurement of the servo rail voltage made by the IO board within the Pixhawk. It has 3:1 scaling, allowing it to measure up to 9.9V. Virtual Pin 103: RSSI (Received Signal Strength Input) input pin voltage (SBus connector output pin). This is the voltage measured by the RSSI input pin on the SBUS-out connector (the bottom pin of the 2nd last servo connector on the 14 connector servo rail). This can alternatively serve as SBus out by setting the BRD_SBUS_OUT parameter ( Copter, Plane, Rover). 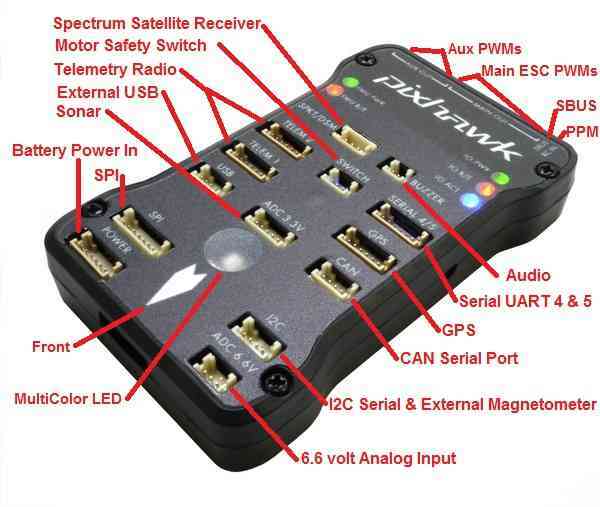 The Pixhawk has no dedicated digital output or input pins on its DF13 connectors, but you can assign up to 6 of the “AUX SERVO” connectors to be digital outputs/inputs. These are the first 6 of the 14 three-pin servo connectors on the end of the board. They are marked as AUX servo pins 1 - 6 on the silkscreen as seen above. 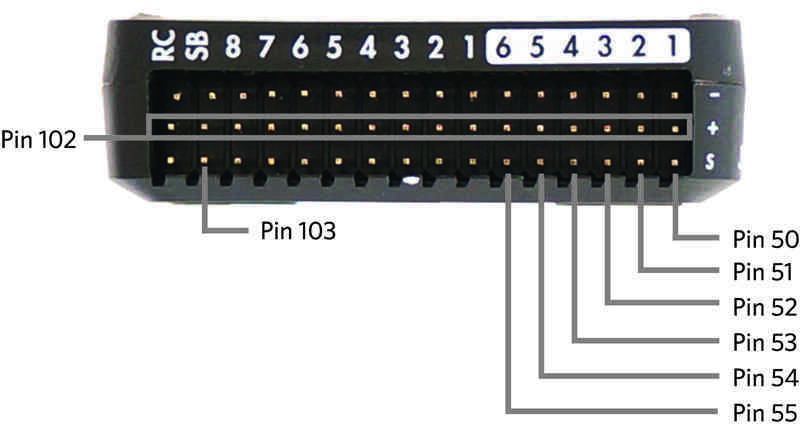 To set the number of these pins that are available as digital inputs/outputs, set the BRD_PWM_COUNT parameter. 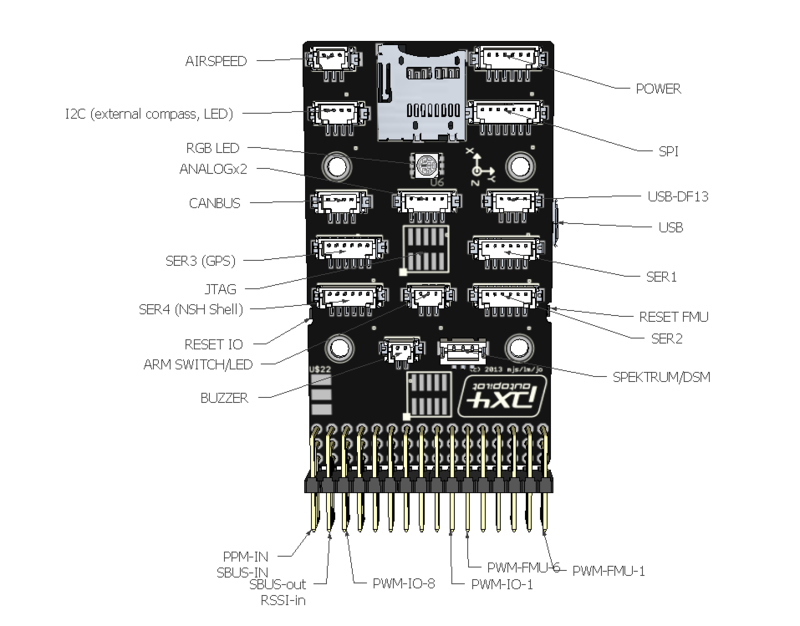 On Pixhawk this defaults to 4, which means the first 4 AUX connectors are for servos (PWM) and the last 2 are for digital inputs/outputs. If you set BRD_PWM_COUNT to 0 then you would have 6 virtual digital pins and still have 8 PWM outputs on the rest of the connector. 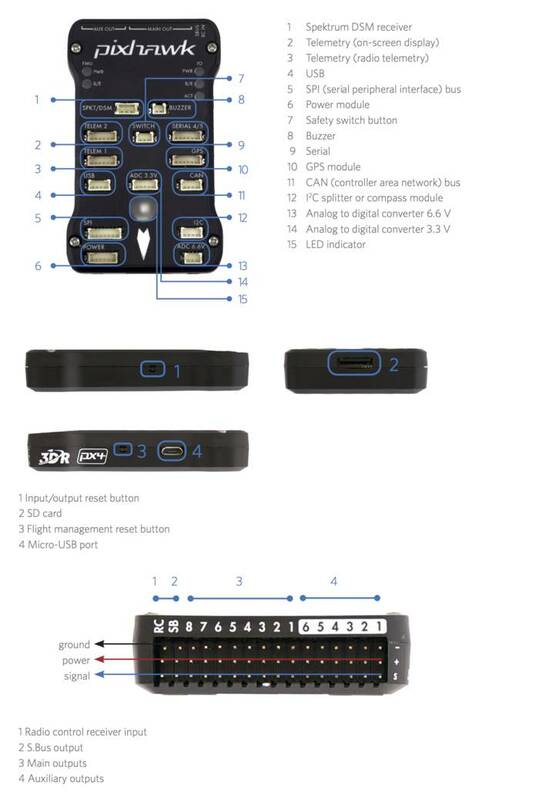 The 6 possible pins are available for PIN variables as pin numbers 50 to 55 inclusive. So if you have BRD_PWM_COUNT at the default value of 4, then the two digital output pins will be pin numbers 54 and 55. By default, the pins are digital outputs as outlined above. A digital pin will instead be a digital input if it is assigned to a parameter that represents a digital input. For example, setting CAM_FEEDBACK_PIN to 50 will make pin 50 the digital input that receives a signal from the camera when a picture has been taken. The topic Powering the Pixhawk explains both simple and advanced power-supply options for the Pixhawk.